The Pro One by Sequential Circuits was a revelation when it was introduced in 1981. Essentially, Sequential wanted to take their classic Prophet 5 synth and adapt it into a less expensive, smaller package. 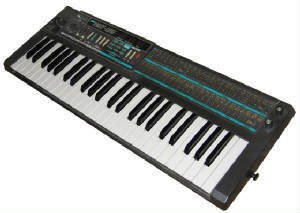 The synth was an instant best-seller, and was featured on many hit records of the time. It had CV/Gate control, 2 VCOs, 3 LFOs (saw, tri and pulse), and 36 keys. It was manufactured between 1981 and 1984. It was responsible for some of the fattest basslines in New Wave, and Vince Clarke of Erasure and early Depeche Mode was an avid user. It also features an arpeggiator and a simple sequencer. It has also been used by Sigue Sigue Sputnik, The Prodigy, New Order, Prince and Soft Cell. Only about 10,000 were produced, so if you find one, snap it up! 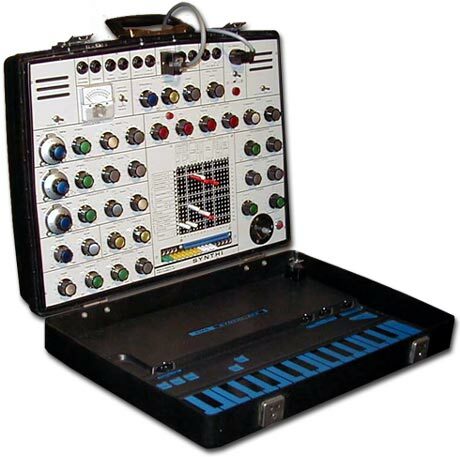 The Synthi AKS was produced in 1971. It went on to be a very popular synthesizer in the 70s, and was still found in numerous studios throughout the 80s. Nowadays, you can expect to pay anywhere from $1000 to $3000 for a used AKS. This synth was very sophisticated for its time, and proved to be a very "in demand" keyboard for many studios and producers during that era. The AKS was housed in a thin plastic briefcase, and it came with a touch sensitive keyboard. It also featured a 256 step sequencer, which in those days was very impressive. Creating sounds with the AKS was unique in the sense that rather than using wires, you placed pins in a small grid. It featured a VCF, a noise generator and a ring modulator. 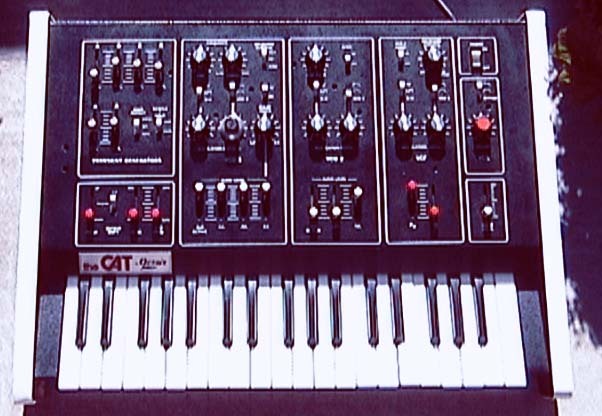 The portability and compactness of this synth made it extremely popular in the early 70s. It essentially offered many of the sounds that larger modulars had, yet in a tinier, more convenient package. The AKS produced classic analogue sounds, and could be heard in the works of Pink Floyd, Yes, Brian Eno, Jean-Michel Jarre and many others. The Octave Cat. I had never heard of this synth. I discovered it very much by accident. I was watching a TV show (on the Food Network, I believe) called "Food Jammers". Basically the show centers on these three funky guys who have lots of time on their hands, who decide to randomly build machines in their living room. Anyway, I get the impression that they are also musicians. One of the guys has an Octave Cat, and he was playing around with it briefly on one episode (before they started to make their own home-made soda) and it sounded very cool. Apparently, this synth was produced between 1976 and 1981. It features two VCOs and two sub-oscillators. It also has one LFO (with sample and hold) as well as one VCA and 37 keys. 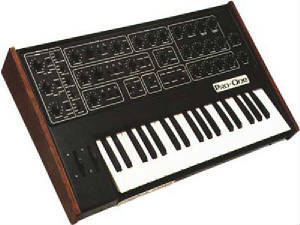 Apparently this synth was VERY similar to the ARP Odyssey, so much so that ARP decided to sue Octave in the late 70s. This synth sells nowadays for anywhere between $350 to $500. Anyone who knows me well can tell you how much I adore this simple little synthesizer. The Poly 800 was manufactured by Korg starting in 1984, and it quickly became a best-seller, mostly due to the fact that it was one of the first professional synthesizers available for less than $1000. A later edition called the Poly 800 Mark Two would also be very popular...it included some additional features and a slightly different shade of casing. I got my Poly 800 second-hand for about $150. That was 12 years ago and I have gotten so much use out of it. For a period of about 10 years, the Poly 800 appeared in just about every song I recorded in my home studio. I still use it to this day as a MIDI master keyboard. The sounds for the Poly 800 are loaded in from data tapes, which you can still find on the internet. There are several parameters that you can play around with, so it is very easy to create your own original patches. The built-in sequencer is gloriously primitive, especially by today's standards (it will hold a whopping 256 notes!). But that's what I always loved about this keyboard. I think it's limitations are what make it so great. You can't get too fancy with the thing. The Poly 800 has a really spacey, soft sound, making it perfect for ambient type music. But, if you play around with the parameters enough, you can come up with some ultra juicey, classic analogue bass sounds. Some of the sounds can make for surprisingly fat chords, too. My Poly 800 is starting to show it's age. The adapter connection is wonky (sometimes it works, sometimes it doesn't). I sometimes have to wiggle the cord to make it come on. Also, some of the keys are starting to go. I have been told by many people that you can do a number of different mods for this keyboard, but since I'm not that good with a soldering iron, I don't dare attempt these mods myself. If you are looking for a simple, fun, cool sounding analogue synth to augment your sound, give the Poly 800 a try. I notice that it frequently pops up on EBay, and it does seem to be one of those old synths that pops up in pawn shops and instrument stores every so often. This is also a great synth for anyone who is just getting started making their own electronic music. I adore it.